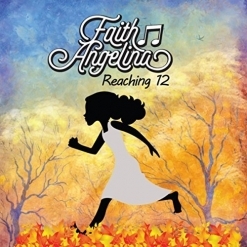 Reaching 12 is the debut album by one very special new artist, Faith Angelina. I can think of only one other album I have reviewed by a 12-year-old (Alexx Carnathan’s Daydreams and Waterfalls), and in my 36 years of teaching piano, I have never encountered anyone this young who could compose a whole album. Faith actually finished the twelfth piece for the album three days before her twelfth birthday, so all but one of these pieces were composed when she was eleven or younger (she wrote a thirteenth piece shortly after her birthday and is saving one of the original pieces for her second album). Faith’s story is compelling in that, due to a hormone imbalance, she had had thoughts of killing herself for half of her young life before the problem was diagnosed. She left a suicide note for her mother to find a year ago (August 2016), so the release of this album is a celebration and a milestone in Faith Angelina’s life. Quoting from the liner notes of the CD: “Reaching 12 is a story of emotional triumph and discovery. It is the completion of a young girl’s journey, a successful climb, and a moral victory captured through a musical journey of emotions in thought provoking melodies.” Is this the best album I’ve ever heard? No, not yet. However, putting the music into the perspective of someone so young, it is truly amazing! Faith started playing the piano “a lot” when she was five years old and began formal lessons at seven. She also loves to play “by ear” and was raised on Paul Cardall’s music. Cardall is a family friend and the album was recorded in his studio. Michele McLaughlin has also become a special friend to Faith, and Faith and her family often attend concerts at Michele’s house. Both of these artists have had a big influence on Faith and have provided ongoing encouragement and inspiration. Reaching 12 begins with “Run With the Wind,” a piece that reminds me of some of Michele McLaughlin’s music. Having been bullied at school, Faith made the choice to picture herself running in the wind rather than letting the bullying get to her. Understandably, the piece is on the darker side, but lightens as it progresses - a very affecting opening! “Sunday Morning Rain” has the steady rhythm of rain falling and expresses a peaceful mood. “Easter Lilies” is a celebration of spring and symbolizes the many changes in Faith’s life - a charming and uplifting piece. “Finding Hope” was a turning point for Faith as she sought help for her self-destructive feelings. This piece is very poignant and one of my favorites on the album. “Lost” is another favorite in that it expresses the powerful emotions of someone who has gone very deep inside of herself. Dark and turbulent, this piece is incredible! The upbeat and joyful “Chasing Rainbows” was the last piece Faith composed for the album and she says that it is about “finding the treasure at the end of our rainbows.” May she find many of them! Faith wrote “Saying Goodbye” for her brother right before he left for a two-year mission for their church and expresses the “mixed bag of feelings” she was experiencing - what a treasure! “Twelve” was written three days before Faith turned twelve and is “my victory march, my celebration, and my statement to the world that I am coming.” We’re ready for you, Faith! Bring it on! Reaching 12 is available from Amazon and iTunes. Truly an amazing album from an amazing new artist, I highly recommend it! A sheet music book is also available and my review is here. 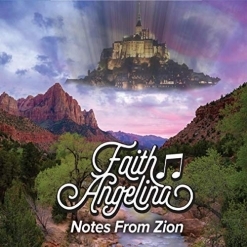 The songbook is available on Faith Angelina's website.